The photo on the right was extracted from an article published in the China Daily on 5 May 2008. 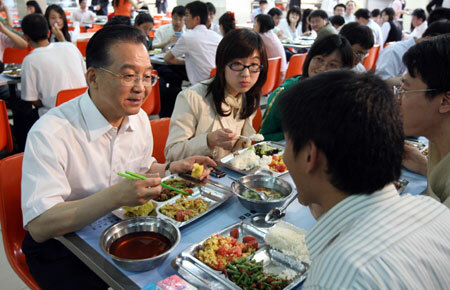 It appears to be an ordinary photo taken from a school cafeteria showing a teacher having a lunch with his students. However, the older person in the photo is not an ordinary citizen of China, he is the Chinese premier, Wen Jiabao. It was taken when he visited the China University of Political Science and Law in Beijing, capital of China, on the day before. As can be seen from the photo Wen was having a conversation with the students in a very relaxing atmosphere. Further, he was eating about the same food as the students. I am very impressed and. in fact, moved by the photo as Wen appeared to be very friendly and down to earth, which is the reason Wen is well known as the People’s premier. What is encouraging is the messages that he conveyed to the students during the visit to the university, which are quoted as below. A law student should develop a high degree of sense of responsibility for the country, the society and the people. He or she should be fair-minded and above all, love this country. To promote democracy, improve the legal system, and rule the country by law is not only a national strategy, but also serves to safeguard the personal rights and freedom of every citizen. We will better implement the policy of “administration according to Law”. only when policies addressing issues of people’s livelihood were stipulated into law, could people enjoy the benefits of these policies for a long term. It is clear that democracy, human rights and the law and order are at the hearts of our leaders and they are policies of our nation. Although the mainland China’s interpretation of those subjects are different from the West (even different from Hong Kong), I think China is moving in the right direction. Although China does not have universal suffrage (neither does Hong Kong), the government and its leaders have the overwhelmed support of its people. I have the confidence that they will lead China to be a more equitable society. During Wen’s visit to the university, he expressed his concern over the recent price rise, and asked the students if they could afford the daily food and whether the scholarship could help them solve their difficulties. As you can see the “food crisis” is affecting China as well, of course, not as severe as on other developing countries. Further, it shows that the Chinese leaders are aware of the grievances of the people in the “main street”.